It’s already April, and of course that means that for many, the Easter Bunny will soon be hopping his or her way into their houses with a basket of treats. Here are a few ideas to consider for your kids- or kids at heart. Tired of hearing your kid’s video games or other noisy electronics? Tell them to put on a pair of headphones, we deserve some peace and quiet once and a while. I don’t need to hear every time your character get a coin, LOL. 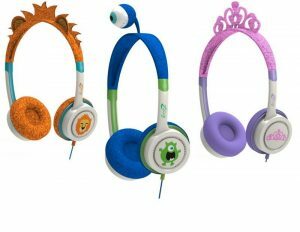 BuddyPhones are volume-limiting kids headphones, which are perfect since kids cannot ruin their hearing by playing the volume too loud. 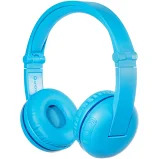 These fun looking and good quality headphones keep the ears of little listeners safe by providing them with the safest, toughest headphones for a decent price. Really- they don’t cost an arm an a leg. They are available in popular colors and designs, including the uber trendy unicorn. Your kids are quiet and entertained (perfect for car and air travel as well!) and parents are not subjected to the same movies, games, or shows over and over again. Thank you, I’ll have that. Water resistant and durable with as much as 24 hour battery life, these also sport wireless connection capability. More then one kid? BuddyPhones offers their patented shared BuddyCable, which is a great option for families with multiple kids and only one device, or when one of them inevitably loses one of theirs at the worst moment. Good backup plan. Available now at www.buddyphones.com or Amazon ($69.90-$79.99). Speaking about games, do you have a little Yoshi fan in your life? Yoshi has a new game just out, Yoshi’s Crafted World. This is Yoshi’s first starring adventure on Nintendo Switch, so it’s a big deal for fans. 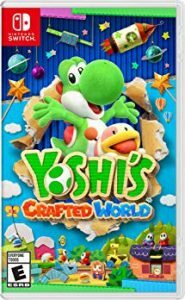 Yoshi will venture through his crafted world, collecting costumes and gems, battling ShyGuys (the most familiar faces in the series) along with thieving mice, and other enemies who await. There is a level that flips stages, and you must do them backwards. Yoshi must help Poochi her puppies back, as they ran off (as bratty pups will do from time to time). Baby Bowser is back, causing a ruckus, as are an all star team of favorite characters your child will love to interact with. For cute additions to your child’s basket, take a look at Rescue Runts Babies. These adoptable mini plush pets let your child rescue, groom, collect and love them. 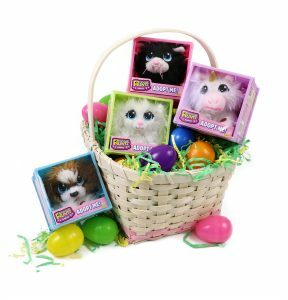 These four-inch plush pets come in small, brightly covered, plastic crates that your child can use at their “home”. These little stuffed animals are in need love, cuddles, and care. Your child can remove “fleas,” brush their fur, and tie collar ribbons, and more to help them go from ragged rescue to valued and loved pet. There are more then 20 pets to choose from, including cats, dogs, wild animals, and mythical creatures. Each Rescue Runts Babies is sold separately, and the package comes with the pet of choice, convertible crate, 3 fleas, brush, ribbon /collar, as well as stickers. $10 at Walmart. If you, like me, like to give a basket to your partner/spouse (or need a gift for friends, bosses, co-workers, clients, etc), look no further then Godiva. These gourmet chocolates are bound to be a hit, the melt in your mouth delights will be savored by any chocolate lover. With many sizes and options available, the most inclusive and varied would be the Enchanted Easter Chocolate Gift Basket. One 2019 Limited Edition – Plush Bunny with Chocolate Foil Easter Eggs, One Milk Chocolate Bunny, One Eggstra Special Assorted 5 piece Chocolates Gift Box, 5 One Classic Milk Chocolate G Cube Box with 22 candies inside, One Solid Milk Chocolate Bunny with 5 Foil-Wrapped Chocolate Eggs,One Truffle Crème Egg 4 piece Assortment,One Milk Chocolate Bar, One Dark Chocolate Raspberry Bar. Something for everyone- or just me. Just me it is. 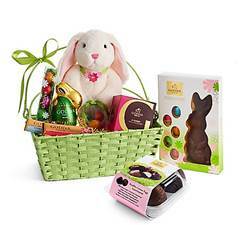 Prices vary per item, this particular basket is $99.95; at Godiva.com with all items included as described and listed.